Diet in the zoo: crustaceans, fish, amphibians, reptiles, and some vegetable matter. Special anatomical, physiological or behavioral adaptations: The uniformly bright-red plumage of the Scarlet Ibis intensifies as the bird grows older. As with flamingos, the brilliant red color of the bird comes from pigments in the bodies of crustaceans on which it feeds. The long curved beak is used to probe for food in mud and shallow water, guided mostly by touch. It flies strongly with its neck extended, almost as if it were gliding. Like other birds, Scarlet Ibis fights with their beak, legs, and wings against enemies in order to protect themselves and their offspring. The bird uses its long beak in a process called preening to clean and smooth its feathers. The males perform courtship displays (attention-getting movements or songs) to attract a mate. No South American birds migrate to North America. Ibises nest in large breeding colonies. Both parents cooperate in building the nest -- a loose pile of sticks -- and in caring for the young birds. . The female ibis lays two or three dull green eggs streaked with brown. After 23 days of incubation, the young hatchling is able to leave the nest. The young are first featherless, and then a dark brownish color, which slowly changes to the red of their parents as they age. Few people know that birds play a vital role in the overall balance of the world's environment. Personal Observations: The feet of the Scarlet Ibis are used to grip tree branches and help them stay balanced. They eat mollusks and crustaceans, two of the organisms we studied in lab. 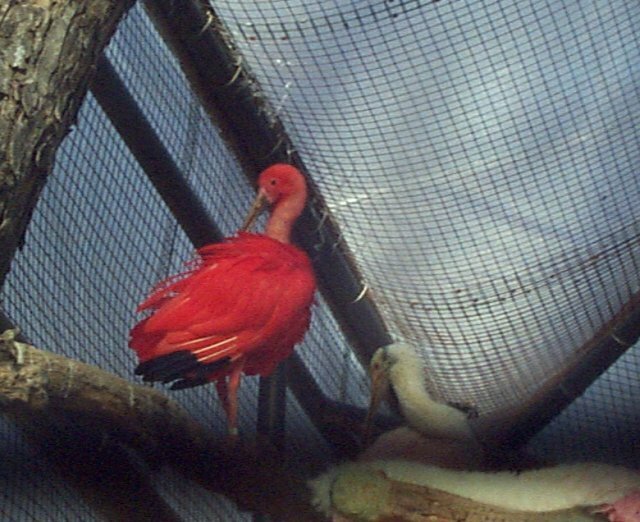 The shade of red that the Scarlet Ibis has is unique and beautiful. 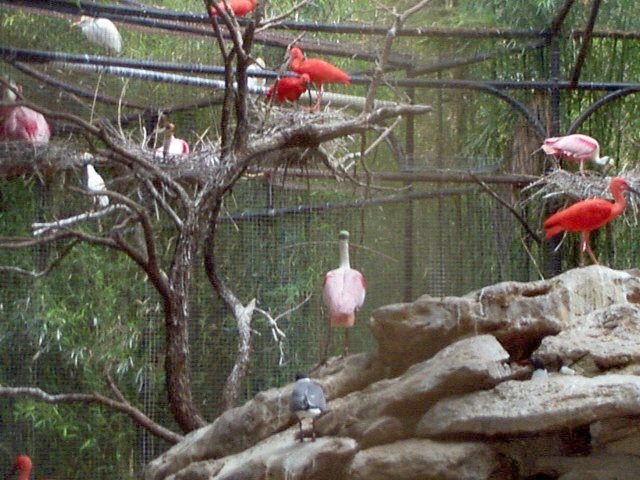 These links might be interesting if you would like to see different kinds of birds who are featured at these zoos.